Our Pastors and those in the front office ordinarily work with family and loved ones to set a date for the funeral or memorial service, and the pastor who will be officiating helps coordinate communication with the funeral director and the family to plan the service. Funeral and Memorial services held at Pinnacle may take place in either the chapel or the main sanctuary. If desired by the family, Deacons offer a reception following the service. The reception is held in the Chapel Conference Room or in Fellowship Hall depending on the location of the service. Light refreshments are provided by volunteers, in addition to tea, coffee, and lemonade. 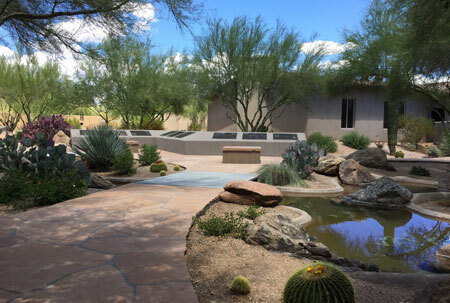 Since 1998, the Pinnacle Presbyterian Church Memorial Garden has been a space set aside for the inurnment of cremated remains of members of the Presbyterian faith, their immediate families and others approved by Pinnacle clergy. 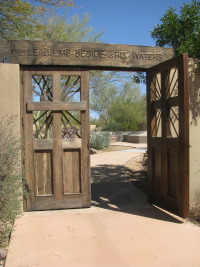 The Garden, which continues the theme of the Pinnacle campus, streams in the desert, is located immediately north of the Sanctuary. It is a place of comfort, reverence, respect and care. It is also the site for an annual memorial service. The Memorial Garden is open year-round, seven days a week during daylight hours. For more information please contact Lisa Boswell, Executive Assistant to the Pastor at 480.585.9448 or email.